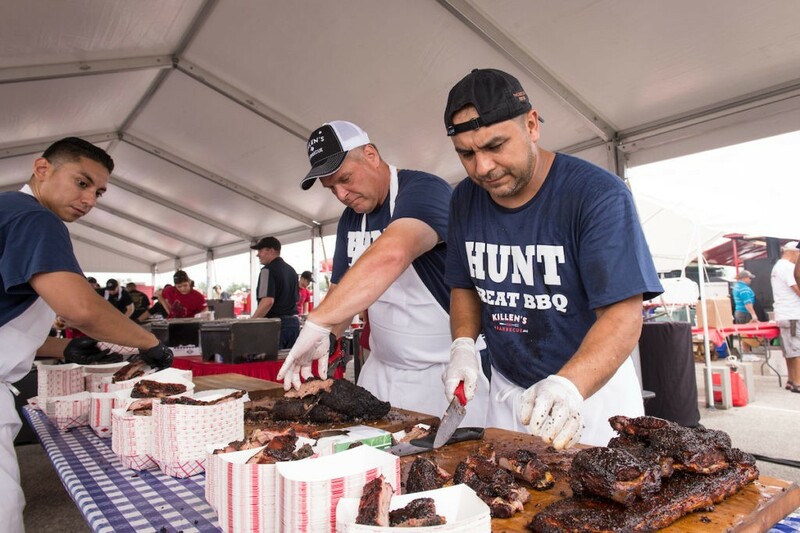 One of the city’s most meaty all-you-can-eat events, the 5th Annual Houston Barbecue Festival will be Sunday, April 9, 2017, from 1 to 4 p.m. at the Green Lot at NRG Park (same venue as the past few years). General admission tickets are available for $60 each at Eventbrite, and on-site parking is available for an additional $10. The festival always sells out, so purchasing tickets online is highly recommended. (VIP tickets are already sold out.) The event will be held rain or shine, and contingency plans are in place in case of severe weather. More information and other frequently-asked questions are also addressed at the Eventbrite link. These guys are pros. Tip: bring a large tray to make it easier to hold multiple samples at once. Photo by Chuck Cook Photography. 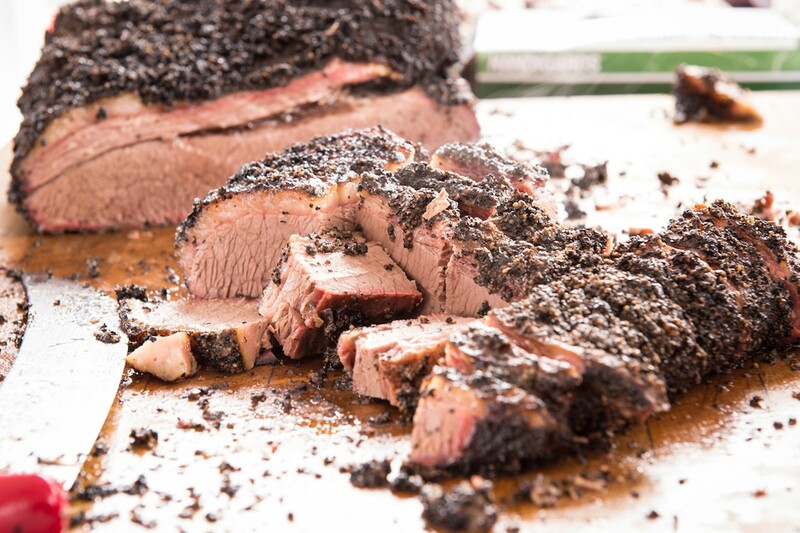 Many favorite Houston-area barbecue joints are scheduled to appear, including Pinkerton’s BBQ, Tejas Chocolate (& BBQ), Harlem Road Texas BBQ, Roegels Barbecue Co., Spring Creek Barbeque, Killen’s Barbecue, Gatlin’s BBQ, Blood Bros. BBQ, Feges BBQ, The Brisket House, CorkScrew BBQ, El Burro & the Bull, Fainmous BBQ, Gerardo’s, Pappa Charlies Barbeque, Pizzitola’s Bar-B-Cue, Ray’s BBQ Shack, Brooks’ Place BBQ, Blake’s BBQ, Lenox Bar-B-Que, and Tin Roof BBQ. Southern Q BBQ and The Pit Room are making their debut this year. As usual, a couple of out-of-town joints are invited to participate, and this year the festival is welcoming back Southside Market & BBQ from Elgin and Bastrop, and Louie Mueller Barbecue from Taylor, Texas. The Killen’s Barbecue team slicing up brisket and ribs for the 2016 Festival. Photo by Chuck Cook Photography. A portion of the ticket sales will benefit Vita-Living, Inc. a 501(c)(3) social services charity in Houston that provides lifelong support programs for adults and children with disabilities like cerebral palsy and autism. Sponsors for this year’s event include Pitt’s and Spitt’s, Saint Arnold Brewing Company, and Ruffino Meats and Food Service. About The Author: Smoked meat enthusiast and regular barbecue competition judge Scott Sandlin authors the Texas Pit Quest blog, maintains the Guide to Houston-Area BBQ map, and is the barbecue (and general meat) columnist for Houston Food Finder. Your delectable comment just made me MORE hungry!